joy of life! joie de vivre! 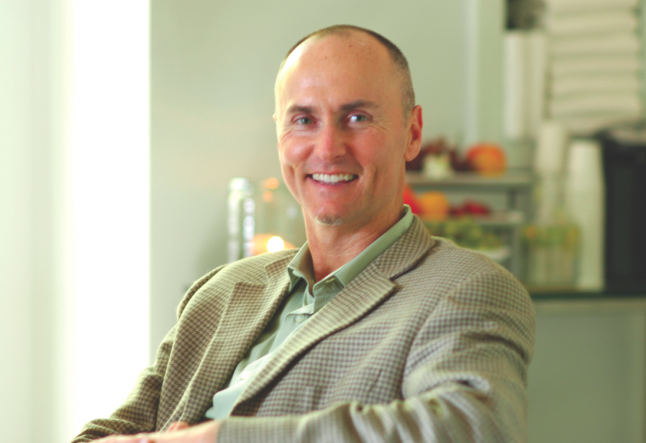 Chip Conley, CEO of Joie De Vivre Hospitality, is one of the world’s best-known hoteliers, and for good reason. His quirky yet welcoming chain of boutique hotels has a philosophy of philanthropy and environmental responsibility that recently earned his Hotel Carlton the honorable distinction of “Green Business” from the city and county of San Francisco. Yogi Times caught up with Chip in San Francisco at Joie De Vivre’s Hotel Vitale. The hotel is as warm and welcoming as Chip himself, sporting plenty of energy for our afternoon interview. Smiling, laughter and joy seem to define Chip and his work. Even the hotel encourages everyone to smile through words lightly etched on mirrors all over the property. Yogi Times: You started Joie De Vivre Hospitality when you were just 26. How long has the company been in existence and what was your original vision? Chip Conley: We've been in business since 1987. The vision with the Phoenix (his first hotel) was creating a rock-and-roll hotel for young people. And beyond that I had a vision that maybe it could turn into a bigger boutique hotel company. I did write a business plan to say I wanted 10 hotels, and now I have many more than that, but I can’t say that there was a specific vision. I never said I wanted to be the biggest boutique hotelier in the world. YT: In what ways are you incorporating social and environmental practices into your business? Chip Conley: Historically, hotels were the gathering spot and the place where people came together to create community; that’s what we’re trying to get back to. Each of our hotels is responsible on an annual basis to create $200 per guest room per year in philanthropic activities for community groups whether it’s catering for groups, free hotel rooms for a dance company coming in from Africa or gift certificates donated for the AIDS Lifecycle bike ride. YT: Can you tell us about Joie De Vivre Gives, the community engagement part of your company? Chip Conley: We have four philanthropic pillars for the company, and they all have Californian elements to them: health and wellness, the environment, arts and culture and education and youth. As a company, every quarter we hold an event for one of these causes, and each individual hotel is responsible for coming up with at least two community partners that are nonprofit organizations. For example, the Hotel Vitale works with the Center for Urban Education about Sustainable Agriculture, the organization that runs the farmers market at the Ferry Building, and they’re focused on organic and sustainable farming practices and how people eat in the Bay Area. YT: Are you working with other hotels to address the challenges and obstacles for the hospitality industry in incorporating social and environmental practices? Chip Conley: We have the Hotel Heroes Awards. It’s an annual set of awards for employees who have gone way above the call of duty. There’s also a community service component. One of the awards we give away is to the hotel that’s made the biggest impact in the community. That’s an award that Joie De Vivre created four years ago, which is now embraced by all the hotel community, and gets hotels to think about doing more within the community. YT: How does Joie De Vivre Hospitality focus on environmental sustainability? Chip Conley: Firsty the idea of sustainability in the hotel business was maybe composting, which is what our hotels do. Maybe the hotel had a card in the room for those who didn’t want their room cleaned. More and more [environmental sustainability] is broadening. We use recycled building materials and are looking at how we can have technology in guest rooms where your card key is connected to the electricity in the room so that electricity is not wasted when guests are away. YT: What do you see as the future of environmentally and socially responsible business in the future? Chip Conley: More and more the customer is looking for green hotels. There are actually projects right now that we are making proposals on where communities, like the Presidio here in San Francisco, have a potential for a hotel going in and are asking for green hotels. Cities and communities are not just saying this would be nice to have, but that this is what we need to have. The Hotel Vitale was not built as a green hotel, but it has green elements. When the Hotel Vitale was built in 2000, there was not a demand for a green hotel. Today, the city would be asking for one. The hotel developers and owners of the world are being smart about going green, and communities that actually approve these hotels in their planning and development process are now requiring it. YT: I understand that Joie De Vivre Hospitality has a new residential project in San Francisco? Chip Conley: The Soma Grand. One of the things that I’m really proud of is that we’ve actually created a City CarShare pod. So somebody could live in that building and have the experience of living in the Soma Grand near Civic Center and not have a car because the City CarShare will be right in the building’s parking garage. That’s an example of trying to be conscious and community-driven and green, not just in building practices but in creating services for the condo residents. YT: Can you tell us about the yoga classes and services you have in your hotels? Chip Conley: I just took a class at the [Hotel Vitale] yesterday. Every morning we have a complimentary yoga class here. It is a free service to all of our guests, and we use a penthouse studio. Yesterday I came in, took the 8 am yoga class and got to know some of the other guests who were there. If you’re somebody who’s traveling, one of the problems with traveling is that you get out of your rhythm. So, how do we keep people in their rhythm? Well, more and more people are doing yoga, and the idea is that somebody could actually come and stay in this hotel and rather than having to jump into a cab at six in the morning to rush three miles away to go to a yoga class—and then rush back, shower and rush to their business meeting, which defeats the purpose—you can do yoga in the hotel. And we only make the classes an hour so that people actually have the time. People really appreciate it. There is a spa in the same area, and the spa is open to guests and non-guests. YT: To what do you attribute your success? Is it joy? Is that your mantra? YT: Where do you see Joie De Vivre Hospitality in the future? Chip Conley: Gandhi once said, “My life is my message,” and I would love to be able to think that our company can say that. Our business strategy is being driven by the kind of world we want to see out there. Our world view has been fused into how we do our business; it’s more relationship-driven, more connected to community. I don’t have a metric to say once we get to this many hotels we’ve made it. I think, frankly, when your company is named Joie de Vivre, you’re saying it’s all about joy of life. How do you put a metric on the joy of life?